In the face of the widespread opposition and violence, Socialist party Greek Prime Minister George Papandreou offered to make way for a national unity government provided it supported EU/IMF bailout plans. But Antonis Samaras, the leader of the opposition conservative New Democracy party, said the conservatives would only take part in a new unity government if it renegotiated the bailout, a condition that's unacceptable to Papandreou. The result was a "political farce of the first degree," according to an opinion column in Kathimerini. "Papandreou backed down from his earlier commitment on the grounds that Samaras treated the prospect of cooperation between the two mainstream parties as a public relations stunt. The status of Greece’s political system has suffered irreparable damage as a result. The country’s credibility in the European Union has been tarnished. Greek citizens are simply waiting to see the consequences of this amateurish -- some people would say criminal -- management of the current crisis, and of the nation’s future. A “deal” with the New Democracy leader would involve a “renegotiation” of the first and second memorandum -- and that was perhaps not accepted by some of Greece’s international peers. A tragic Papandreou on Wednesday transformed himself from politician into a fatal hero." The people in Athens are furious about the situation they're in. When Greece was granted the first bailout in May of last year, Papandreou demanded severe austerity measures, and promised that this would solve the problem. 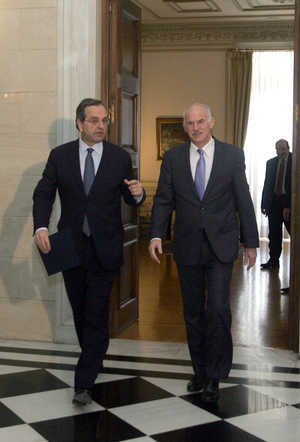 Now Papandreou is back making even MORE austerity demands -- tax hikes, public sector layoffs, and so forth. How do we know, the Greek people are asking themselves, that Papandreou won't be back a few months from now and demand even MORE austerity? This situation is just loaded with irony. It was perfectly obvious a year ago that Papandreou was lying. In fact, European officials have done nothing BUT lie in the last year. And when EU officials were caught in a series of major lies about Greece a couple of months ago, Eurogroup chairman Jean-Claude Juncker was quoted as saying, "When it becomes serious, you have to lie," as I reported at the time. So now Papandreou is being called on his lie. Would Greece have been better off if Papandreou had simply told the truth from the beginning? It's impossible to know, of course, but it's hard to believe the situation would be worse. There's an old saying that "If you understand a problem, then you're 90% of the way to solving it." That isn't true, because there are many problems for which no solution exists, even when you understand the problem. This is one of those problems. There is no satisfactory solution in existence. When bond yields go up, it means that the market is increasingly convinced that the bonds are going to default. Last year's bailouts of Greece, Ireland and Portugal were supposed to guarantee that these three countries were out of the woods -- that's what all the politicians promised us. And what's clear from all of these graphs is that the bailouts have made no apparent difference whatsoever. The market has steadily increased bond yields, betting that the countries are all going to default. Last year's bailouts didn't slow this trend at all, and nobody with any sense could possibly believe that the next bailout will make any difference either. Last year's austerity measures didn't help Greece's economy, either. In particular, Greece is unable to meet the conditions it agreed to in return for last year's bailout, and unless it meets those conditions, it will not receive the next 12 billion euro tranche on the bailout at the end of the month. This will force Greece into bankruptcy. Incredibly, the yields on Greece's 2 year bonds surged above 28% on Wednesday. Other yields surged as well. It's hard to imagine a greater and more immediate crisis for Europe. Europeans are taking sides, with the French and the Germans leading the opposing camps, according to the Telegraph. 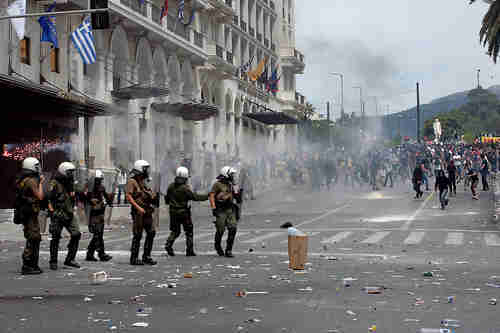 The French want the Greeks to impose even deeper austerity measures, no matter how painful they are -- to the Greeks. The Germans don't want to bail out the Greeks at all, but if they have to, they'll do so only if Greece goes through a partial default, in effect making the investors (mostly European and American banks) bear some of the bailout burden. "The pattern is repeating itself. The finance ministers cannot agree, and shift the debate up to the European Council, who will present the miracle of an agreement at next week’s European Council (a stage set that unfortunately creates much uncertainty, and actual damage in the meantime). The outcome will be a purely voluntary rescheduling, which is a euphemism for “no rescheduling”, as nobody in their right mind would voluntarily take up any exchange offer, and to the extent they do, the rating agencies, and everybody else, will conclude that they have been forced. At yesterday’s unscheduled eurogroup meeting, Schäuble launched a last-ditch attempt to save his plan, but there was no majority in support. There will be another meeting on Sunday night in Luxembourg ahead of next week’s scheduled meetings, which will be followed by the EU summit. Angela Merkel and Nicolas Sarkozy will meet in Berlin on Friday – a meeting that could pave the way for a compromise." In other words, allowing Greece to default in any way will be so disastrous that the Germans will back down and agree to a full-scale bailout -- just give Greece whatever money it takes to pay its bills. I guess I have to agree that that seems to be the most likely outcome in the next two weeks. But I keep coming back to this story because, even more than the situations in Libya and Syria, the situation in Greece could be a major game changer in the next few weeks, no matter what bailout decision is made. The relentlessly increasing bond yields displayed in the graphs above indicate enormous market distortions that the eurozone can't handle much longer. If Germany and France are committed to unlimited free bailout money for Greece, then Germany and France will also be in danger of economic collapse as well. 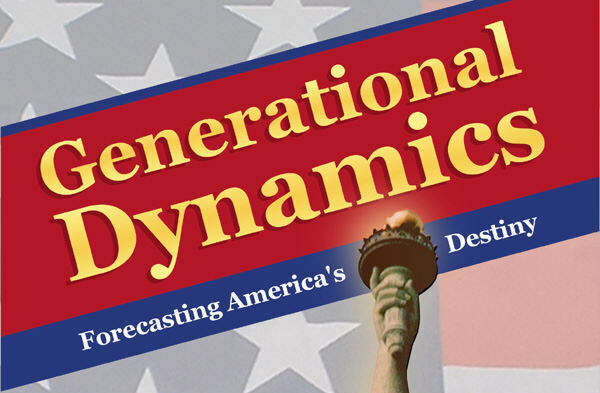 It may well be that the can has been kicked as far down the road as it can go without a real financial crisis -- for Greece, for Europe, for America, and for the world.